Flexible solar panels can, as their name suggests, flex; but should not be confused with Flex solar panels (which is a brand) that certainly won't. Flexible solar panels are also very lightweight and these two characteristics make them useful for camping, rapid transport and deployment in emergencies; and for use on caravans, vehicles, and even aircraft. On buildings they can be applied to curved surfaces or structures where weight is an issue. As flexible solar modules can be glued directly to the surface, existing penetrations don't need to be used or new penetrations made. Their efficiency has greatly improved over the past few years and while they can't match the best rigid silicon solar panels, flexible solar panels are available with efficiencies that are comparable to the average new rigid silicon panel. The large majority of solar panels found on rooftops use silicon solar cells that are not flexible, so I really don't recommend trying to bend them. Sure, you might find they have a little bit of flex in them if you jump up and down on them, but that really isn't a good idea and you'll see why if you fall off the roof. The thinner a substance is, generally speaking, the easier it is to get it to flex. While the PV material in all modern panels tends to be thin these days, some is still thinner than others and so easier to bend. These thin film solar panels can be made into flexible solar panels, but usually aren't. Instead they are mostly produced on glass or other rigid substance that keeps them stiff and unyielding. While roughly 7% of the world's solar panel production is thin film, only a very small portion of that is produced as flexible solar panels. There are two main types of flexible solar cells that are commercially available, amorphous silicon and Copper Indium Gallium Selenide, or CIGS cells. There is a third type emerging, organic solar cells, that may be available for purchase in the future. However, I have to admit that I said the same thing in the past about organic solar cells when now was the future – and we're still waiting for them. Yet another type are CZTS solar cells, which use copper, zinc, tin and sulfide – and those are some way off from prime time also. Amorphous Silicon: Most rooftop solar panels are made with crystalline silicon. In crystals, apart from defects and impurities, the atoms are all lined up in orderly formations. Amorphous basically means, 'not a crystal', and atoms tend to be arranged all higgledy-piggledy. But, as you may have guessed, this can be useful for making a material that can bend or wobble without breaking. Amorphous Silicon is used to make the most flexible solar panels currently available, and a company called PowerFilm, which sells flexible amorphous silicon cells to the US military, produces panels that are 17% efficient. While I really don't recommend it, you could probably eat an amorphous silicon flexible solar panel and be fine. Physically, that is. Mentally, I wouldn't be so sure about that. Amorphous Silicon PV is not toxic and the polymer they are encased in is not likely to be dangerous either. Copper Indium Gallium Selenide (CIGS): As you can tell from the name, these are made from a combination of four materials. Their efficiency has been dramatically improved over the past few years, and as of the time of writing, there are panels on the market that claim to be 18% efficient. However, when it comes to flexibility they are not the champions of bendiness. While copper is not very dangerous, the other three elements that make up the abbreviation CIGS are toxic and during the manufacturing process care must be taken to prevent workers being exposed to them. However, CIGS solar panels themselves do not release toxins under normal use and are safe to handle. Just don't eat them. They should be disposed of thoughtfully, but the good news is the materials they are made of are valuable and should be worth money to recyclers, so there probably won't be a shortage of people willing to take them off your hands. Organic Solar Cells: While apparently not yet on the market, organic solar cells have plenty of potential to make plastic solar panels that are as light and flexible as a $100 note. Or if you are not that rich, a $5 note. They could be extremely cheap to make, but currently they have the disadvantages of low efficiency and relatively short lifespans. But there are people working on them and maybe it won't be too long before you are able to buy an electronic T-shirt powered by plastic organic solar cells or even roll them out on your roof. Mind you, this is exactly the same thing I said some years ago. Copper, Zinc, Tin and Sulfide (CZTS): CZTS cells are being pursued due to the elements they require being common and cheap (unlike the indium in CIGS). It will still be a while before these are commercially available, but it's nice to know leading the charge in CZTS are researchers from the University of New South Wales. Some flexible solar panels live up to their name better than others. While CIGS flexible panels generally have no problem matching the contours of a caravan or boat roof, or curved building surface, they do have limits in how far they can be flexed, so it is important to be sure the application you have in mind for them doesn't exceed their limits. There are some CIGS panels that are flexible, but which come with aluminium frames which have to be physically bent to match the surface they are being attached to, and this is probably not what most people have in mind when they think of the word flexible. Meanwhile, there are amorphous solar panels that can be wrapped around a 5 centimeter diameter cylinder without being damaged. There are also flexible solar cell systems that are made to be folded, but note that it is flexible material between cells that is folded and not the actual cells themselves. Folding flexible cells that are currently being sold will damage them. There are a variety of methods that can be used to attach flexible solar panels to surfaces, but a common one is to simply glue them in place. This can potentially make installation quick and easy and minimise wind loading on roofs or wind resistance on vehicles. It also gives the advantage of not having to penetrate the surface if it doesn't already have existing, and hopefully intentional, penetrations that can be used. A drawback of setting panels flush with a roof is they are likely to suffer from a greater reduction in performance from heat than rigid panels set above the surface on racks because air cannot circulate underneath and cool them. This can also result in the structure they are on becoming warmer than it would otherwise. CIGS and amorphous silicon solar cells are expected to have lifespans comparable to rigid silicon solar cells. However, the flexible polymer that encases them can degrade over time. Particularly if it is flexed a lot in use. As a result, product warranties of only one year are common, although three and five year warranties are also available. 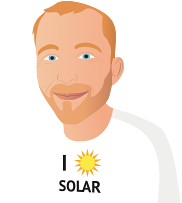 In comparison, a quality rigid silicon solar panel will often have a 10 year product warranty these days. The good news is that because the cells themselves can be long lived, better coverings are likely to be developed and so we are likely to see products with longer warranties. Note that product warranties differ from performance warranties. Performance warranties can be for a long time, but won't actually help you if your panel stops working, Product warranties definitely should help with this, and so are much more important. Many people find the light weight and convenience of flexible solar panels extremely useful for anything that has to be on the move, and plenty of people have attached them to boats and caravans. Some tradespeople have put them on their trucks to directly power or charge electrical tools and equipment. During the day or with the use of batteries, they can replace portable generators and the need to transport fuel, and there are fold out and roll out flexible solar panel systems specifically used for disaster relief efforts. Flexible solar panels may become a common feature on electric cars where they could supply a portion of the vehicle's energy use, and because of their light weight they could also become widely used on things such as drones and airplanes. Flexible solar modules are being integrated into an increasing number of portable electronic devices. 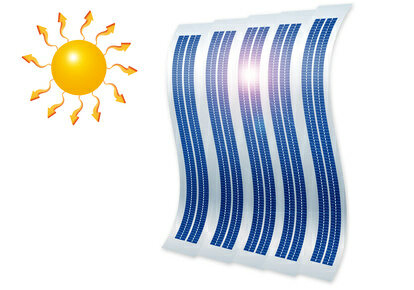 Flexible solar panels are great for the right applications. However, due to their cost and concerns about their lifespan, they only comprise a tiny portion of world PV manufacturing – probably considerably less than 1%. So we are unlikely to see them commonly used on rooftops instead of rigid panels any time soon and they are likely to be confined to mobile applications. However, if there is a breakthrough in their cost and reliability, and if that happens with organic solar cells, then we may have low cost flexible solar panels that are willing to bend over backwards for us.